Lumenera’s INFINITY2-2 digital CCD camera offers excellent sensitivity, high resolution and a wide dynamic range for brightfield, darkfield, and DIC imaging applications. With 1616X1216 resolution and on-board processing, the INFINITY2-2 delivers outstanding image quality for a wide variety of scientific applications. Live video preview provides for real-time focus while auto exposure and auto white balance efficiently capture your optimal image. An intuitive user application provides camera controls while full integration to popular third-party imaging applications is available through our TWAIN drivers. The USB 2.0 digital interface ensures a simple plug and play installation – and one standard cable minimizes camera clutter. Every INFINITY camera includes INFINITY ANALYZE software for advanced camera control, image processing, measuring and annotation, as well as INFINITY CAPTURE, an intuitive user interface which includes all of the basic features needed to control your INFINITY camera and capture images. 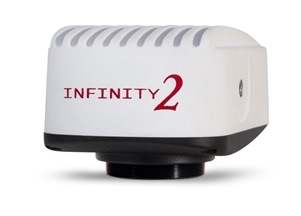 The INFINITY2-2 is available in color or monochrome. Contact us for more information on our board-level OEM and custom camera enclosures. INFINITY cameras are supported by an experienced team of technical support and imaging experts. We understand your imaging needs and are here to help you get the most out of your camera.